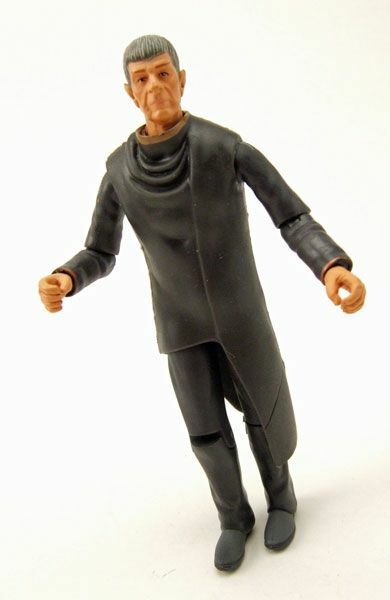 This Spock was released carded as part of the Playmates Star Trek 2009 6" figure line. The Rundown: Well, I've held off on doing this for almost 2 years now, but I really feel that my time has come. I just gotta face the music... take it like a man... rip that band-aid off with one quick pull. 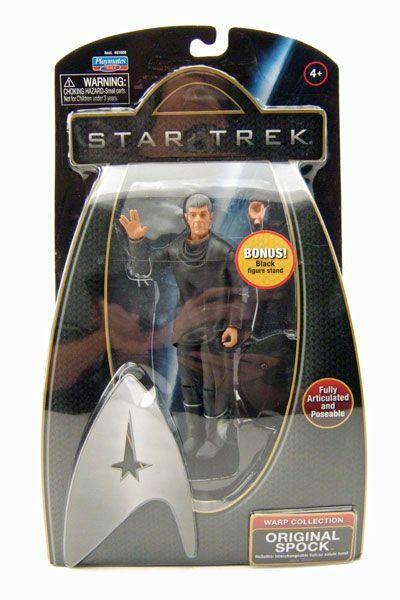 That's right folks- It's time to start spotlighting the Playmates 2009 Star Trek line. Why have I waited so long to do this you ask? For starters, I've always wanted this blog to really stick to items related to the original series and the first seven feature films. The 2009 film is a little tricky. While part of me wants to separate it into its own segment of Trekdom, the other part of me wants to acknowledge it as a part of the classic canon... especially with the inclusion of Nimoy's Spock. I needed to let this inner argument gestate for a bit before I really opened the door to the '09-inspired merch. The second reason is a bit easier to explain... For me, the Playmates 2009 toys just didn't seem all that great. With a different scale and style than the previous Playmates Trek offerings, I wanted to give myself some time to get to know these guys before committing my opinions on them to the blog. But like I said... That time has come! And what better place to start than with the guy that ties it all together- The Original Spock! Let's take a gander at him! 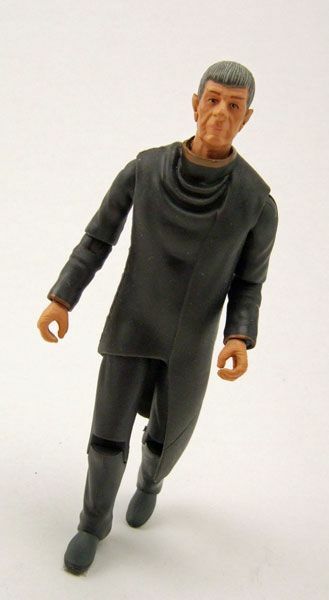 Playmates released 3 differently scaled lines of figures for the Star Trek 2009 movie: A 3.75" line called the "Galaxy Collection", a 6" line dubbed the "Warp Collection, and the 12" "Command Collection". 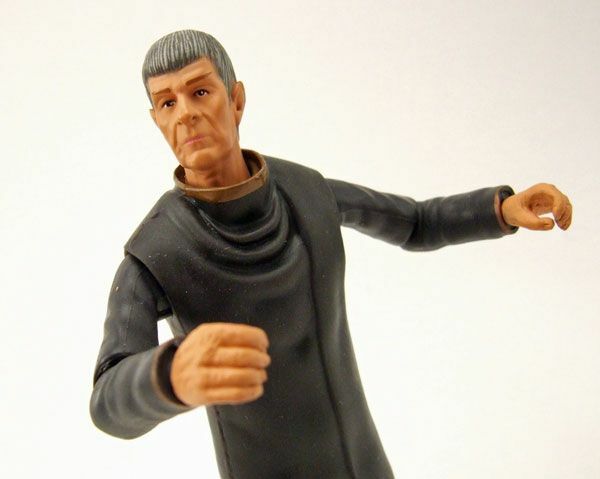 I compromised with myself and went with the 6" version of Spock for this first foray into spotlighting the line. We'll start at the top of the figure and work our way down. The head sculpts of the 2009 Playmates product are WILDLY hit-or-miss, with some featuring decent likenesses and others... not so much. Spock here is one of the better efforts, with a head that bares a pretty solid likeness to the elder incarnation of everyone's favorite Vulcan. As we move down, it becomes obvious that these aren't your daddy's Playmates Star Trek figures. While the old line sometimes had issues with properly scaling the heads to the bodies, the '09 line does a nice job of balancing proportions. The upper body articulation is nice as well, with a large range of movement in the arms and a hidden torso joint supplying a large range of posing options. Here's where things start to fall apart unfortunately. 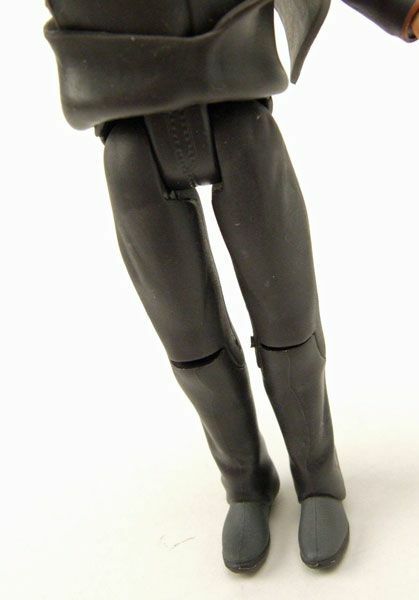 In order to hide the torso joint, many of the 6" figures feature rubbery coverings over a buck upper body. 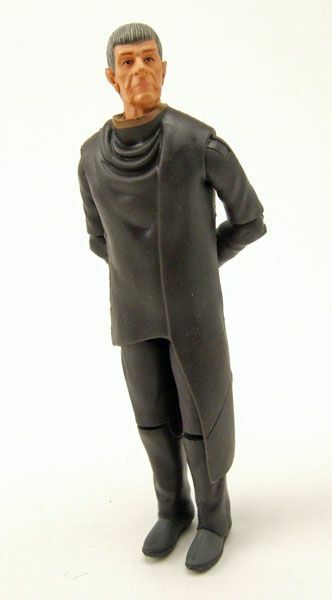 The material used here seems more durable than the stuff used on the Art Asylum figures, but it also feels REALLY gummy on this Spock due to its thickness. The body sculpt itself is pretty "soft" overall as well, giving the figure a somewhat cheap appearance when compared with other contemporary figures made in the 6" scale. My biggest gripe on the figure though has to be the hip joints. While the arms feature a wide range of movement, the hip articulation is relegated to a simple T-joint... meaning he can sit down and that's about it. I could almost forgive this if the legs were at least posed a bit further apart, but they aren't. Spock is perpetually stuck with his legs fairly close to each other, severely limiting his poseability. Even the V-joint hips of the 90's figures worked better than this... and I hated those V-joints. 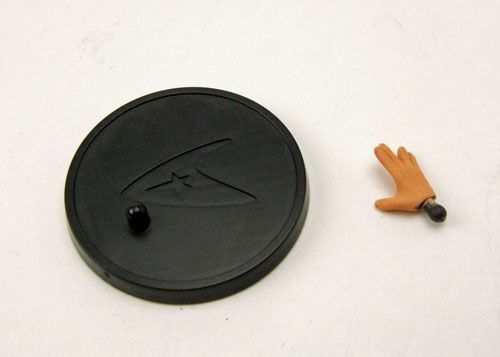 Accessories: Spock includes an interchangeable hand and a black figure stand. While I understand that Spock didn't really use any weapons in the film, I still feel Playmates cheaped out here. Why not stick a vial of "red matter" in with him? That would have been pretty cool. 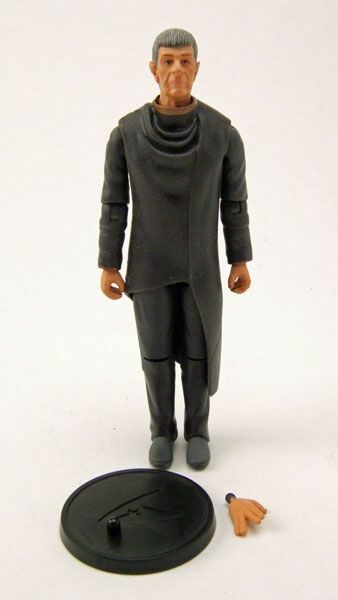 While the '09 Playmates line as a whole isn't all that great, this Spock at least has a few good things going for him. 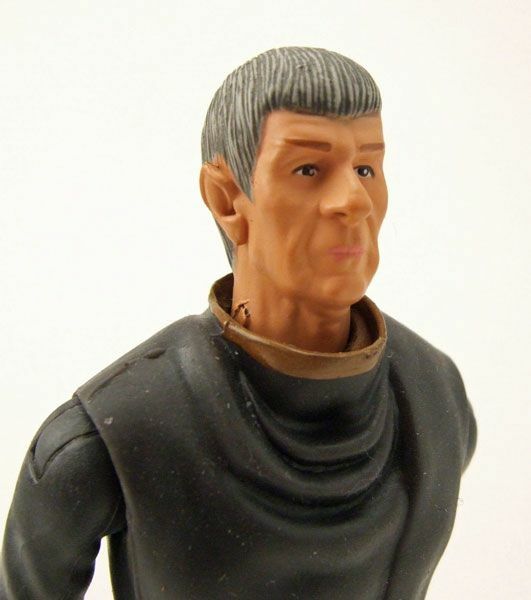 The head sculpt is strong, the articulation is at least half-decent... and it's Leonard Nimoy's Spock! If you are thinking of trying this line out (especially at the current closeout prices nationwide), Original Spock might be a good place to start. Using him, you can decide if you have need for the many, or need for the few... or just the one. See what I did there? Yeah, that was a TWOK reference. Kudos to me! I still haven't seen that movie. I think the hip movement is limited because of the age of the character. Too much movement and you have a broken hip! Noooo! Don't compromise this awesome blog with New Trek items! I can stand the Nimoy Spock figure since he is the original Spock, and don't get me wrong, I really enjoyed the new movie, but (imagine Captain Kirk -- yeah, the real, original Captain Kirk -- saying this) it's not...real...STAR TREK!!! Rocky- Ummmm... What have you been doing for the past 2 years man!?! Frederick- Yeah, but shouldn't Spock have plenty of movement there still? After all, he is a pretty "hip" character... Wokka wokka! I'm waiting to get a free copy when I renew my subscription to Nacelles Monthly. 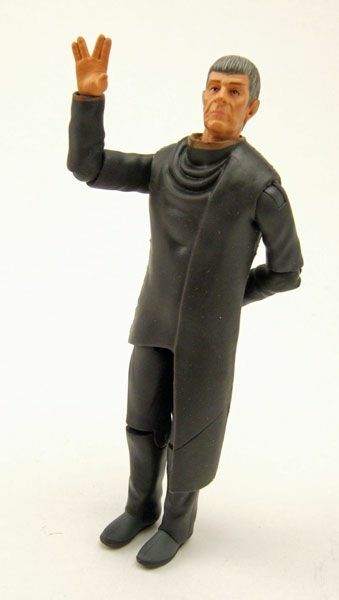 otaku5003, I made a 6'' Sarek figure from this spock figure and a nero figure. it's actually really cool. 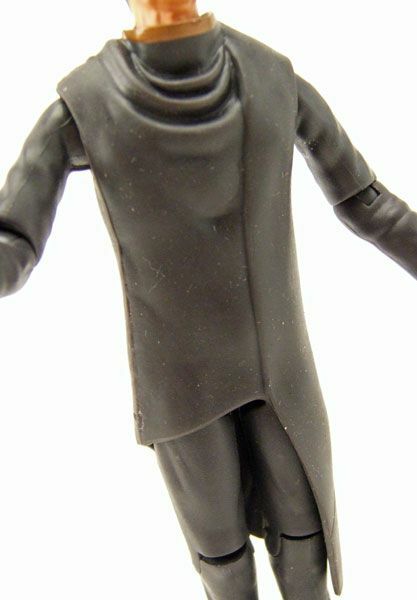 otaku5003, I think the rubber shirt covering the pivot joint is what makes these figures truly unique.